A Short History of Women opens in England in 1914 at the deathbed of Dorothy Townsend, a suffragette who starves herself for the cause. Her choice echoes in the stories of her descendants interwoven throughout the book: a brilliant daughter who tries to escape the burden of her mother's infamy by immigrating to America just after World War I to begin a career in science; a niece who chooses a conventional path—marriage, children, suburban domesticity—only to find herself disillusioned with her husband of fifty years and engaged in heartbreaking and futile anti-war protests; a great-granddaughter who wryly articulates the free-floating anxiety of the times while getting drunk on a children's playdate in post-9/11 Manhattan. 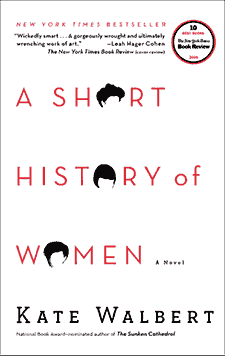 In a kaleidoscope of voices and with a richness of imagery, A Short History of Women explores the ways in which successive generations of women have responded to what the Victorians called "The Woman Question."